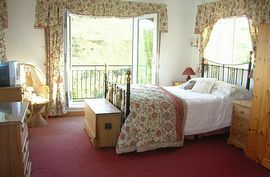 Self catering cottage ideally located for secluded beaches, country walks and an excellent dinner in the Britannia Inn. Riverside is situated in one of the most picturesque vantage points in North Gower. 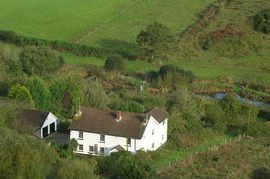 The property enjoys stunning rural views and is equipped with oil-fire central heating as well as a wood burning stove. The entrance hall has an attractive tiled Victorian fireplace, piano and bookshelves. 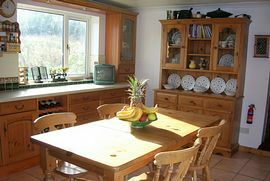 The large farmhouse style kitchen/breakfast room is fully equipped with dishwasher, microwave, cooker and fridge. The utility room has a washing machine/tumble drier and fridge/freezer. The downstairs cloakroom is fitted with a shower, sink and WC. 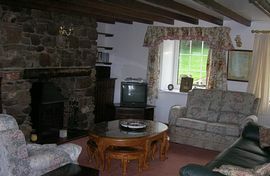 The spacious beamed lounge/dining room has an attractive stone fireplace with wood burning stove. It is furnished with 3 sofas, occasional furniture, colour TV, dining table and chairs. The property can accommodate 8 people in one twin and three double bedrooms. The large master bedroom has an antique bedstead, large fitted wardrobes and chest of drawers. The en-suite bathroom has a shower cubicle, bath, sink and WC. 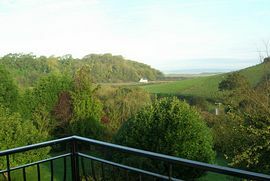 The balcony from the master bedroom has superb views over the Loughor Estuary and Gower countryside. The second bedroom has a double bed, wardrobe, dressing table, sink and en-suite shower and WC. The third bedroom has a double antique bedstead, large wardrobes and dressing table. The twin bedroom has a wardrobe and dressing table. The main bathroom has a bath, shower cubicle, sink and WC. There is also a separate WC and sink. Woodburning stove (wood not provided). Well behaved dogs - £10. Large garden with patio area. Patio table and chairs. Large pond, not covered, so please be careful with children. Local Services: Local shop in Llanmadoc. Post Office and Petrol - Llanrhidian Garage (4 miles). Britannia Inn - Restaurant and Pub fantastic Food. Leave the M4 at Junction 47 and take the 2nd exit signposted for Swansea A483. Take the 2nd exit at the 2nd and 3rd roundabouts signposted for Llanelli A484. At the 4th roundabout take the 1st exit, (Gowerton B4269). Under low bridge get in right lane and turn right at traffic lights onto the B4295. Continue straight on this north Gower road through villages of Penclawdd and Llanrhidian. Approximately, 1/4 mile past Llanrhidian turn right at Oldwalls (opposite the Greyhound Inn). Continue on this country lane for approximately 3.5 miles until you arrive at Cheriton. Approaching Cheriton you will descend a rather steep hill, and go past Cheriton Church. The road bears round to the right and Riverside is the first white cottage on the right. If you go past the Britannia Inn you have gone too far! Riverside is about 150 meters east of the pub on the same side of the road. The cottage is open all year round.